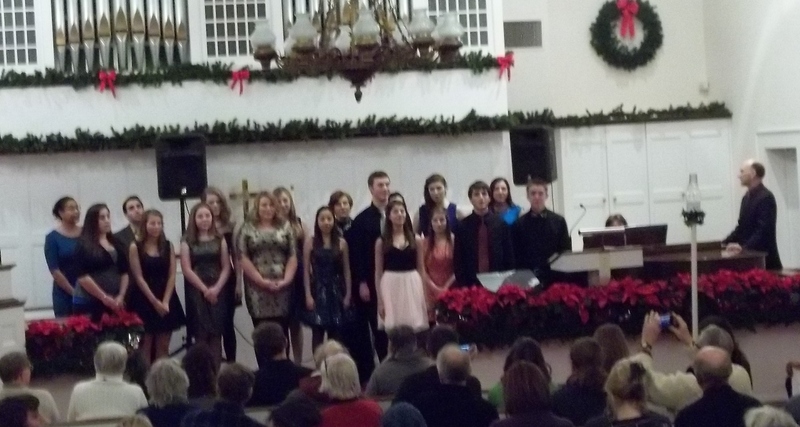 John Murelle’s vocal students performed songs of Richard Rodgers at First Night Chatham on December 31 at the First Congregational Church of Chatham. In addition to John’s regular students (including my daughter Gabbe Rowland), there were two former students of John’s: Matt Astone, now in his senior year at Westminster Choir College, and Lily Mae Harrington, who dropped out of Westminster Choir College last fall (2011) to compete in the Glee Project for a chance to appear on the television program, “Glee.” “The Glee Project” ran weekly last summer, with one hopeful contestant tearfully eliminated each week. Lily Mae made it almost to the end. She was home for Christmas and New Year’s, but has decided to remain in L.A. to try to make it as an actress.